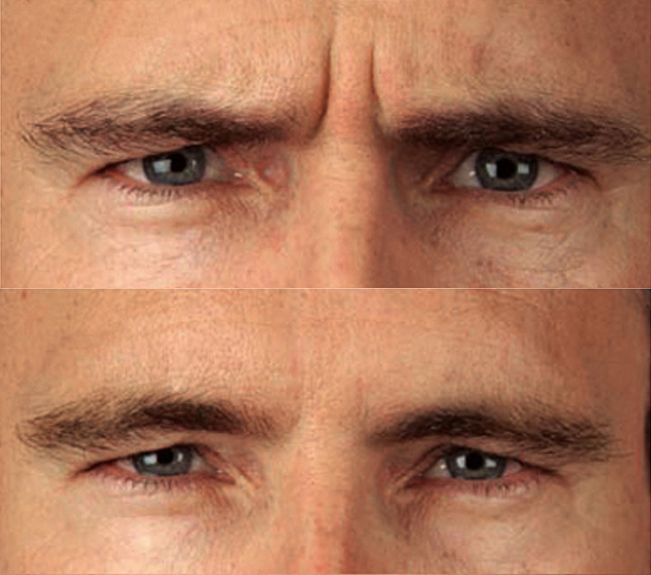 “Dynamic wrinkles” are caused by repeated muscular contractions such as frowning, squinting and brow furrowing. For example, when we frown, we gather the tissue between our eyebrows into a fold. This can cause a chronic furrow which produces a frustrated, discouraged or angry facial expression. 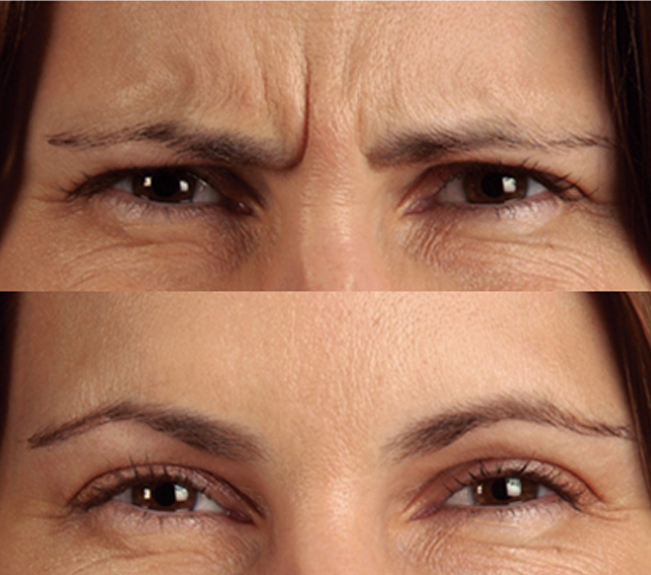 These frown lines can be eliminated without surgery and without scars, by a simple treatment with cosmetic Botox® injections. About Botox® Botox® is a purified protein produced by the Clostridium Botulinum bacterium. Botox® Cosmetic is a non-surgical treatment that can temporarily reduce moderate to severe frown lines between the brows, around the eyes and mouth by causing the weakening of targeted muscles. 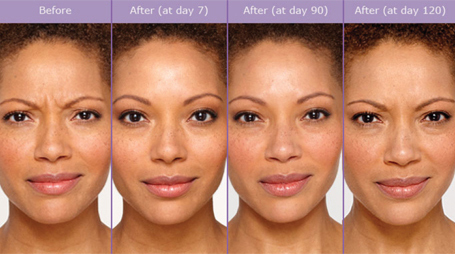 During treatment, very low doses of Botox® Cosmetic are injected directed into the muscles that cause stubborn lines. Botox® works by blocking the transmission of nerve impulses to the injected muscles; this reduces the activity of the muscles that cause those persistent lines to form. As the muscle weakens, the wrinkles in the skin gradually soften and often disappear, giving the face a more relaxed and refreshed look. Because of its effectiveness and safety record, Botox® injections are now one of the leading non-surgical treatments for upper facial wrinkles. Prior to Treatment Prior to treatment you will be scheduled for a complimentary consultation with our medical director with expertise in aesthetic injections, as well as over 20 years experience in creating beautiful aesthetic outcomes for patients of all ages. Our medical director will recommend a custom treatment program based on each client’s medical history and needs. As the dosage varies from client to client, a price quote will be provided at the time of consultation. Treatment The treatment will take roughly 10 minutes, and no recovery time is needed. Discomfort is usually minimal and brief. Your aesthetic professional may choose to numb the area with a cold pack prior to performing the injection to minimize any discomfort. Post-Treatment After treatment you may experience some mild redness which usually lasts for approximately an hour. Rarely, patients experience a mild headache or some minor bruising and swelling. Most patients return to regular activity immediately. Strenuous exercise should be avoided for 4 hours after injection and the treated areas should not be rubbed for 24 hours after treatment. 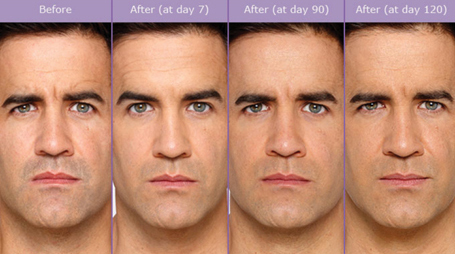 You should contract your frowning muscles frequently for the first hour after treatment to work the product in. The Results Within days, you will see an improvement that can last up to 4 months. 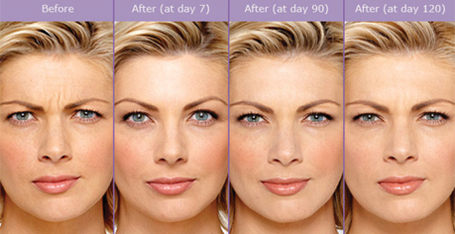 Although the results will be noticeable to you, a treatment with Botox® Cosmetic will not radically change your facial appearance or make you look as if you’ve “had work done.” The muscle activity that causes lines and wrinkles is reduced, so you are still able to frown or look surprised, but without the wrinkles and creases. 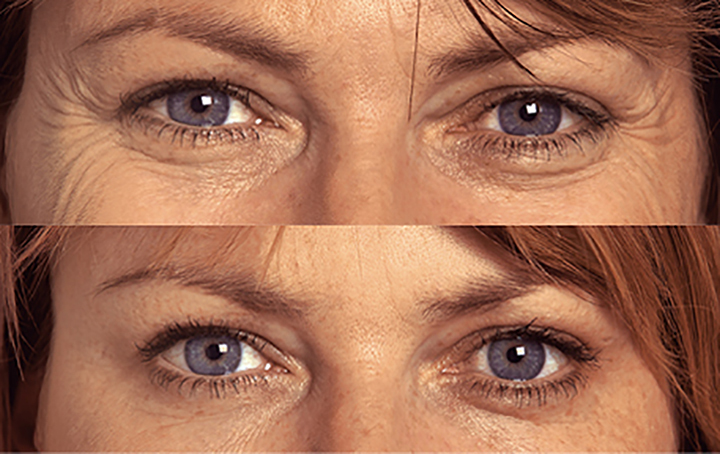 Lines and wrinkles will continue to improve for up to a month, and results can last for up to 4 months. Contraindications Botox® should not be administered to pregnant women, nursing mothers or individuals suffering with myasthenia gravis or muscle diseases. Sudbury Botox at SKIN Medispa RELOOK. RETHINK. REIMAGINE. Professional, caring, friendly, concerned, highly experienced staff. Painless experience with botox and fillers. Fantastic, natural looking, accurate results. Statistics show 2 of every 5 Canadians report that sweating is an issue for them. If your sweating concerns are influencing your everyday choices, you may be suffering from hyperhidrosis (HH), a medical condition that causes needless sweating. • Does sweating have an impact on your lifestyle? • Does embarrassment or nervousness cause you to sweat? • Do thoughts of sweating consume you on a daily basis? • Do you worry that others may notice your sweat marks? • Do you carry deodorant with you on daily basis? • Do you avoid light coloured clothing because you tend to have sweat marks? • Do you avoid physical contact with people because of your sweating? • Are you only able to wear certain materials to avoid sweat marks? • Does your sweating impact your summer wardrobe choices? Botox® is a purified protein produced by the Clostridium Botulinum bacterium. Botox® injections can be used as a way to temporarily improve hyperhidrosis for up to 6 months. The injections work to prevent the activation of the sweat glands, freeing you from dreaded sweat marks. During treatment, very low doses of Botox® are injected directed into the muscles in the affected areas. Botox® injections have the ability to temporarily block the secretion of the chemical that is responsible for activating the body’s sweat glands, effectively preventing sweating in the injected area. Prior to treatment you will be scheduled for a complimentary consultation with our medical director with expertise in injectable therapies, as well as over 20 years experience in creating beautiful aesthetic outcomes for patients of all ages. Our medical director will recommend a custom treatment program based on each client’s medical history and needs. As each program is customized, a price quote will be provided at the time of consultation. The treatment will take roughly 20 to 40 minutes, depending on the size of the area being treated. Discomfort is usually minimal and brief. Your aesthetic professional may choose to numb the area with a cold pack prior to performing the injection to minimize any discomfort. A tiny needle is used to inject small amounts of Botox® just under the skin of the areas that experience excessive sweating. Most patients experience a painless and comfortable experience and are immediately able to resume their daily routine. After treatment you may experience some mild redness which usually lasts for approximately an hour. Rarely, patients may experience some minor bruising and swelling. Most patients return to regular activity immediately. Sleeping or strenuous exercise should be avoided for 4 hours after injection. Botox® injections are a good option for those considering temporary and non-surgical options to reduce sweating. You should notice a significant reduction of sweating from the treated areas within a week of your treatment. These injections do not remove or permanently deactivate sweat glands and so ongoing maintenance visits are required to retain the effect. Each person’s level of sweating varies; however, most patients find that two treatments a year often produce the desired effect. Migraines are an acute neurological disorder that can be highly debilitating. Often initially misdiagnosed as a less severe headache disorder, chronic migraines are more frequently seen in women but can also occur in men. Anxiety, stress, sleeping habits and even diet can influence the severity of the disorder. Misdiagnosis may be the reason for so many individuals being unaware of their treatment options. Those who have suffered with migraines know how debilitating they can be. During a migraine, these individuals can be forced to leave work early, miss out on social events, and are often unable to concentrate or even sleep. While many are familiar with the cosmetic uses of Botox®, most are unaware of the success it offers as a migraine treatment. Following multiple clinical studies, Botox® injections were approved by the FDA for the prevention of headaches in adults diagnosed with Chronic Migraine. Those eligible for treatments are adults, 18 years or older, who have headaches that last 4 or more hours, occurring at least 15 days each month. The injections, which are administered to the facial and neck muscles, help to prevent migraines by reducing the muscle tension in those areas. The reduction in tension decreases stress on the patient’s nervous system, lessening the severity of the headache or preventing the migraine entirely. Prior to treatment you will be scheduled for a complimentary consultation with our medical director, with expertise in injectable therapies. Our medical director will recommend a custom treatment program based on each client’s medical history and needs. A price quote will be provided at the time of consultation. The treatment will take roughly 20 to 40 minutes, depending on the size of the area being treated. Discomfort is usually minimal and brief. Your aesthetic professional may choose to numb the area with a cold pack prior to performing the injection to minimize any discomfort. A tiny needle is used to inject small amounts of Botox® just under the skin of the treatment areas. Most patients experience a painless and comfortable experience and are immediately able to resume their daily routine. After treatment you may experience some mild redness which usually lasts for approximately an hour. Rarely, patients may experience some minor bruising and swelling. Most patients return to regular activity immediately. Strenuous exercise should be avoided for 4 hours after injection. In clinical trials, Botox® provided a significant reduction in headache days after the first treatment. After the second treatment, Botox® prevented up to 9 headache days a month. Botox® is a preventative treatment, meaning it is used to prevent headaches and migraines from occurring. Generally, treatments are recommended every 12 weeks.